The Victoria & Albert Museum's Postmodernism: Style & Subversion 1970-1990, curated by Glenn Adamson and Jane Pavitt in 2011 and 2012, was the first major exhibition of postmodern popular culture, design, and architecture. The exhibition catalogue, edited by Adamson and Pavitt, "follows several other major V&A exhibitions that have tackled the 'grand narratives' of twentieth-century style: Art Nouveau, Art Deco and Modernism amongst them." The catalogue begins with a long essay surveying the postmodern landscape, followed by forty short chapters, each concentrating on a particular and specific aspect of postmodern culture. The editors note the "kaleidoscopic structure of this book - our own single narrative, accompanied by a 'heap of fragments', essays that are multi-vocal and wide-ranging, addressing the particular, episodic and personal". 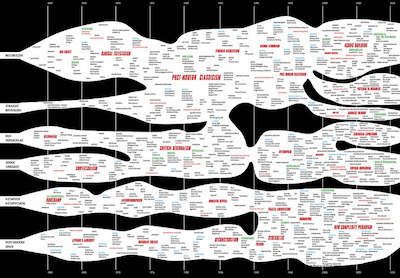 This reflects the cultural fragmentation associated with postmodernism, as illustrated in Four Post-Modern Streams, an infographic by Charles Jencks (author of the influential The Language Of Post-Modern Architecture). 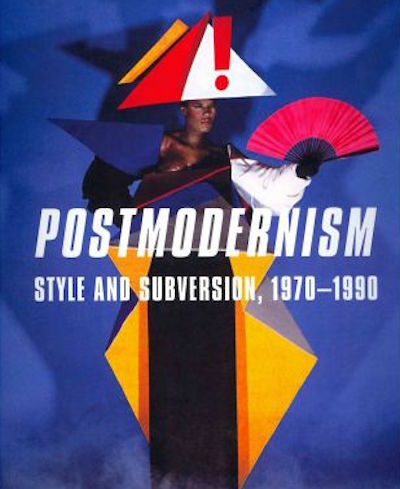 The Anti-Aesthetic, edited by Hal Foster, was the first anthology of postmodern theory, and remains a key text.